The 7.9' Lowel Uni-Stand is constructed with thick-wall, anodized aluminum alloy tubing to deliver an exceptionally high strength-to-weight ratio. It has a standard 5/8" top stud with safety undercut, adjustable base spread, and collar-clamping for each segment. The Uni-Stand has replaced the ViP stand, offering greater height, a wider base, and larger locking knobs. Designed for ViP, Tota, Omni, and all other small lights. Box Dimensions (LxWxH) 21.89 x 3.071 x 2.835"
Uni-Stand (7.9') is rated 4.4 out of 5 by 14. Rated 4 out of 5 by ken from Taller than Bogen's Nano 001 Slightly longer when folded but goes higher than Bogen's mini lightstands which is popular with strobists. Not as sturdy feeling as heavier duty lightstands but works fine holding up a flash and umbrella and they're portable. If you don't need to travel with them much, you're probably better off getting heavier stands (air custioned ones like the Savage are less expensive and more sturdy). Rated 4 out of 5 by Robin from A nice little stand Legs are solid flat bar stock - not tubing. This is a traditional construction that isn't seen very much anymore (bent tubing kinks & breaks pretty easily). Also the legs unfold in reverse like the Matthews Reverse stand, so you can easily place weights when the legs are extended to 90 degrees without them sliding off. Of course the legs can be unfolded even more if you need an extra 6 of height. The fittings are metal castings - not plastic, so they are a bit more durable. Rated 5 out of 5 by Chele John from You can't beat quality! Long time freelancer and I've owned almost every light stand available. I learned my lesson early. If you buy cheap, the product does not last. Light stands are on item which always take a beating. 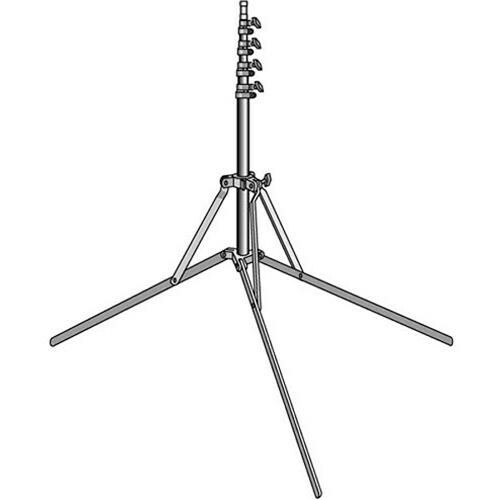 I love the UN33 Light Stand for two simple reasons. The fold up shorter than most and are durable. It'w why I don't buy any other. I don't want to ever be penny wise and pound foolish again! Rated 3 out of 5 by Bradleye from Fold up small These stands are great because they fold quite small, under 22 which fit in my Lowelpro AW 300 Roller bag. But I own a few of them and when you tighten them too hard, the collars just crack. Seem a bit brittle. Ive had many collars break. They still function cracked, but only because I have lightweight speedlights on them. Rated 5 out of 5 by Rob from Great light stand Our first impression of the stand was they were a little light duty, but after using a few times I really enjoy the stands. They are light weight, easy to pack around, and over all I get the impression that they are going to serve us well for years to come. Rated 4 out of 5 by RPLR from Uni-Stand I bought this stand for travel. It fits in my suit case. It opens up and i can set it at the height I want for portrate or fashion lighting as I need. It holds an ubrealla and my speed light. I bought this stand for certain needs it fulfills these needs. Rated 4 out of 5 by Coloartist from Great stand, very short folded up, Great stand for travel. Very short folded up and still goes to 8' tall. Sways a litlle when fully extended. Needs adapter to connect to most gear. Has small female threaded whole in the center on top of stud.